Hearts earned a superb 2-1 victory tonight away to Kilmarnock in sub-zero temperatures at Rugby Park. Two goals in four minutes from Sean Clare and Steven Naismith had the Jambos 2-0 up, before Jordan Jones reduced the deficit with a penalty on the stroke of half-time. 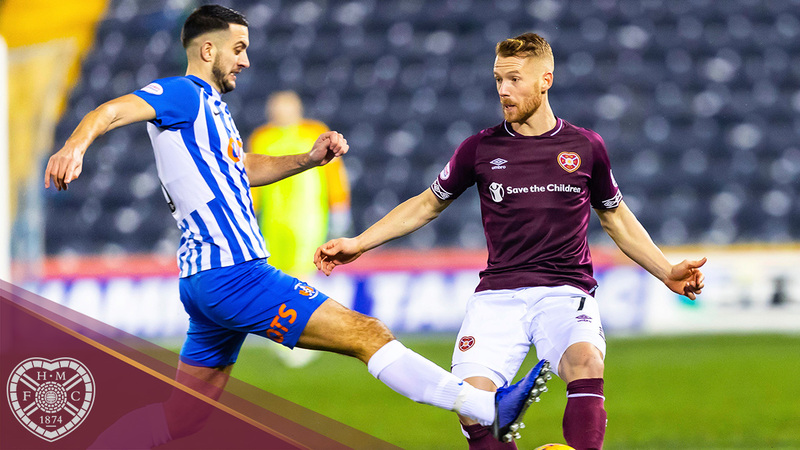 Despite a Killie throwing everything forward in the second half, the visitors killed the game in expert style, restricting Killie to long-range efforts to inflict their second win of the season at Rugby Park on the high-flying hosts. Craig Levein made two changes from the side that defeated St Johnstone on Saturday, with Olly Lee and Marcus Godinho dropping out, Conor Shaughnessy and Callumn Morrison taking their place. Both sides went into the game having won 4 of their last 5 matches, and Killie looked dangerous at the start, with Jones having a cross deflected onto the post. 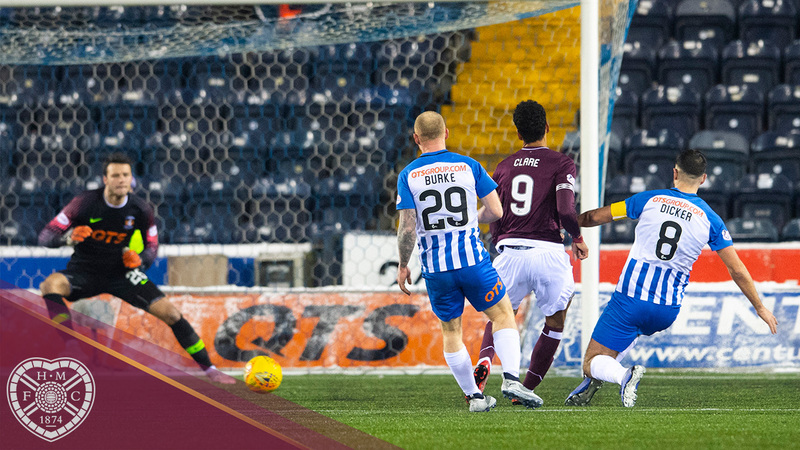 Arnaud Djoum tried his luck twice from distance, first bringing out a save from Dan Bachmann, then firing over from the edge of the box as Hearts responded. Chris Burke threatened three times in 2 minutes for Killie, firstly forcing Colin Doyle into a save when Jones broke into the area from the left, then crossing across the face of goal, before shooting straight at Doyle. Seven minutes before the break, Hearts took the lead in style. John Souttar played a long pass to Morrison, whose control allowed him time to lay the ball to Djoum. The Cameroonian found Clare, who drove into the area and fired a superb shot off the post and into the net. Four minutes later, it was two. Clare stood over a free-kick and, with Michael Smith making a dummy run, Jake Mulraney was played in by Clare. The winger cut the ball back to Naismith who hit a left-footed effort home from 12 yards. However, Killie were given a lifeline on the stroke of half-time when Christophe Berra tripped Alan Power. Jones stepped up and sent Doyle the wrong way to reduce the arrears. This Hearts side has steel to it, though, and showed it in the second half. 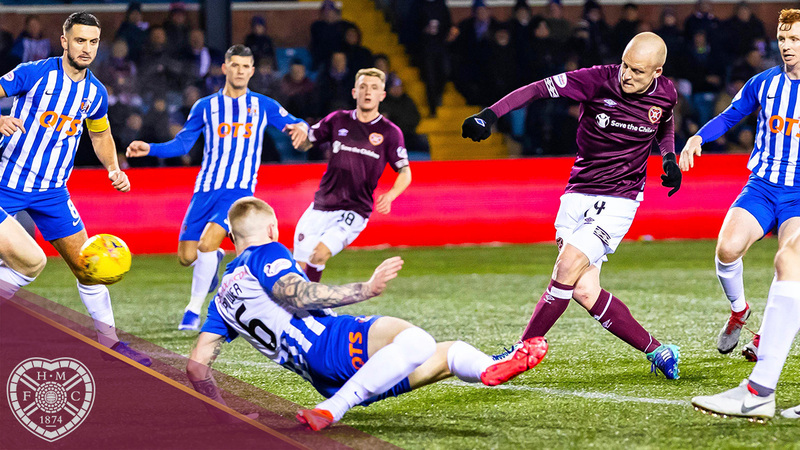 As the temperature plummeted, Hearts kept their focus and restricted Kilmarnock to efforts from outside the area, the most notable of which was a free kick from Power 30 yards from goal that went wide. Indeed, Hearts had the best chance of the second half with 5 minutes to go on the counter, when Naismith was played through by sub Lee, and crossed for Demi Mitchell, who had replaced Mulraney. The ball bounced up and Mitchell was unlucky to see his effort go over the bar on the turn. Despite five minutes of time added on, the Jambos were untroubled and extend their lead over St Johnstone to five points, putting them just three points off second place. Kilmarnock: Bachmann, O'Donnell, S. Boyd, Findlay, Taylor (McKenzie, 78'), Power, Dicker, Tshibola, Jones, Burke (Millar, 78'), Ndjoli. Subs: MacDonald, Bruce, Broadfoot, Waters, Frizzell. Hearts: Doyle, Smith (Dikamona, 85'), Shauhgnessy, Souttar, Berra, Bozanic, Clare, Djoum, Naismith, Mulraney (Mitchell, 68'), Morrison (Lee, 46'). Subs: Zlamal, MacLean, Cochrane, Keena.